The first winter at the new colony was very hard. About half of the colonists had died by spring. By what must have seemed incredible luck or divine providence, the colonists were able to make contact with two Natives who could speak English. One of these was named Samoset and he had learned some English from English trappers and fishermen. He introduced the Pilgrims to the other man, Squanto, who had a truly remarkable life. Captured by Englishmen, he was taken to England and instructed in the English language in the hope that he could serve as an interpreter. When he was brought back to New England, he was captured again, this time by members of John Smith’s expedition who planned to sell captured Indians as slaves in Spain. In Spain, some friars learned of this plan and had the Indians freed and instructed in the Catholic religion. Squanto was able to make his way back to England and then across the Atlantic. There, he discovered that his whole tribe had been destroyed by the diseases, probably smallpox, that the Europeans had brought to the New World. 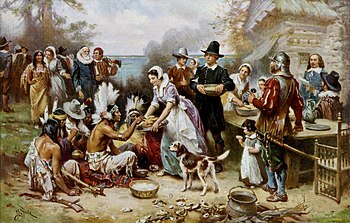 The First Thanksgiving, painted by Jean Leon Gerome Ferris (1863–1930).